No question that gray is the new brown. Do you love pastels, but don’t want them to look childish? Choose a grayed version and it’s all sophistication. Grayed pastels are rooted in Scandinavian design, which I personally love. The gray below is about as true gray as you can get, but you can use gray without it being THIS gray. I hear people say gray is cold – this doesn’t have to be the case. 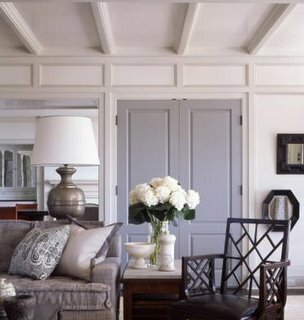 Grays with the right undertones can be warm and soothing. Peaceful, not at all cold. 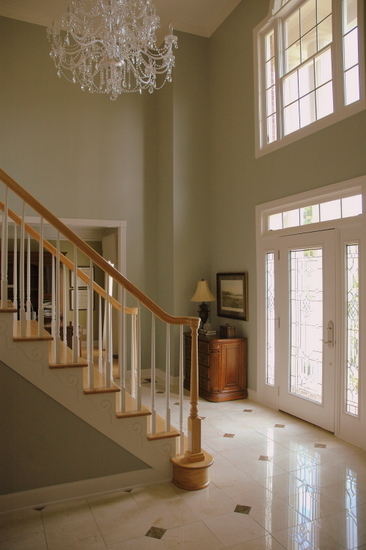 I chose one of my favorites for my friend’s formerly chilly entry – Sherwin Williams’ Oyster Bay. A great neutral with greenish-blue undertones. Another misconception is that adding gray to a color makes it look dingy. Not true. It makes it look grown-up and elegant. 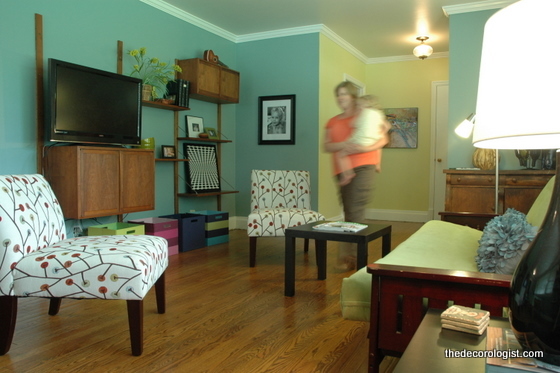 The last thing you want is your new blue living room to look like a baby boy’s nursery! 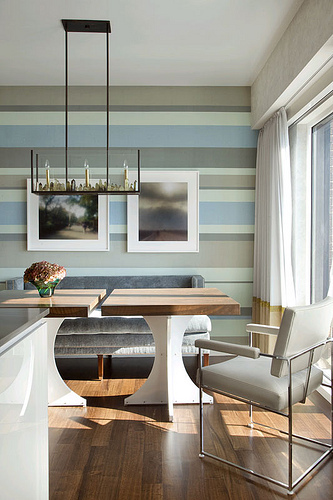 With the right dose of gray, you can still have the color you want, but no baby connotations. 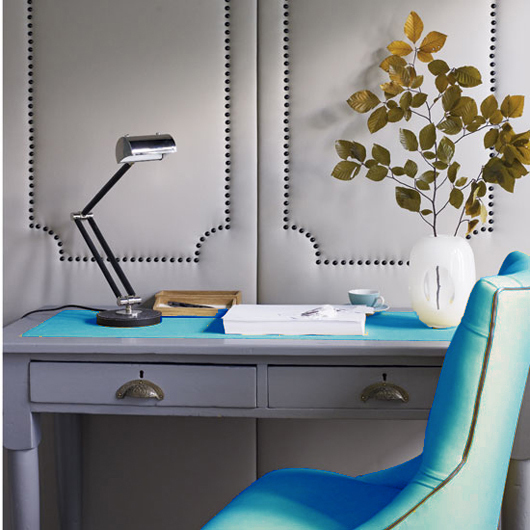 If you like the color below, Benjamin Moore’s Wales Gray 1585 might work for you. In fact, I have found that whatever undertone is in the gray – that’s what you see when it’s up on the wall. You make look at a small swatch that looks pure gray to you – but you paint a room with it and it looks totally blue because that’s the undertone that will emerge. Undertones of gray can be blue, green, purple, or taupe. Make sure you like the undertones, because that’s what you’re gonna see the most of once it’s on the wall. This room reads green, without a hint of mint. Looks a lot like the Oyster Bay I used in that entry. Grays with blue and green undertones work really well together, too. You like chocolate browns with pink? with blue? Me, too – but gray (light gray to charchoal) with those colors is even better and looks super-current and fresh. And are you thinking that gray and brown don’t work together? Oh, contraire! Gray can bring your browns up to date. 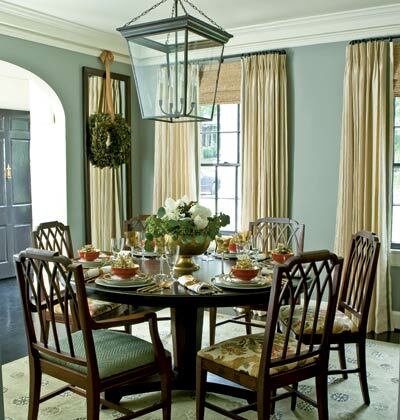 Try Benjamin Moore’s Winterwood 1486 to get this look. It’s all about knowing how much gray to use, and what undertones to look for. But that’s what I’m here for. 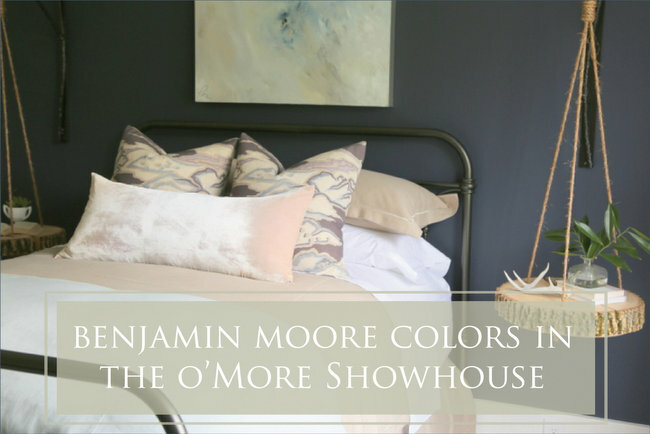 If you need my help, find out more about a Color Consultation with The Decorologist. Photo Credits: Alkemie, StoneBrook Staging, My Home Ideas, Things That Inspire (4,5), Flickr (6,9), Decor Pad, The Lennoxx Zymichost. This entry was posted in Color Consultation, Popular Posts and tagged benjamin moore, benjamin moore wales blue, benjamin moore winterwood, blue room, gray and pink, gray blue, gray dining, gray greens, gray living, gray paint, gray paint colors, gray room, gray walls, how to decorate with gray, nashville color consultation, nashville color expert, nashville decorator, paint colors, sherwin williams oyster bay, sherwin williams paint, the decorologist. 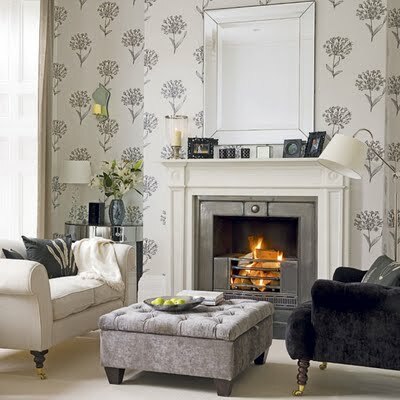 Love, love, LOVE the wallpaper in the first picture! i love how feminine the gray in these images feel. good by gray of the 80s or of mens suiting! LOVE how they turned that small closet into an office, in that picture with the pink. Wish I had one of those! Kristie – I’m so glad to have met you at Maria’s workshop, and to learn of your great blog! Wow! 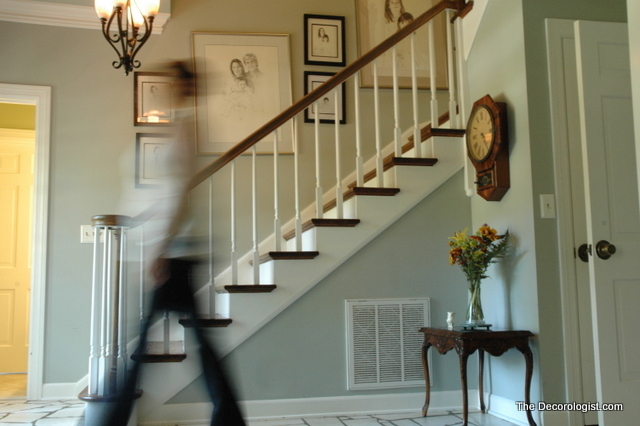 Also, I just love the photo of your friend’s foyer painted with Oyster Bay. What a beautiful color to use in there! that is so NOT the way to decide on colors – that photo makes me nervous!!! are you happy with the mega greige? could you tell me where the grey tufted ottoman in the 1st picture is from? 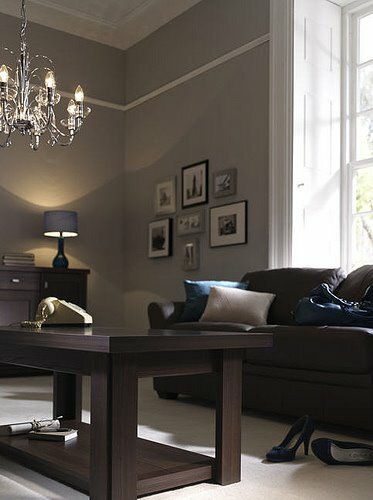 Try Metro Gray – light gray with a purple undertone, should look good with plum furniture. I have a yelow goldish color in the interior of my home . I want a nice grey that doesn’t look white but looks light grey . I have tried several and they all look blue . I want a true grey color. Than I want a darker grey and they all look purple . I don’t know what yo to . We are looking for a light grey that has brown undertones. We have a lot of cherry colored wood trim in our house and we are looking for a grey that will look good with that. We are tired of the once pretty light brown color that is all over the house now. How do you decide on paint color if painting on wall is not the way to go??? I need help deciding!! I’m trying to find a light to medium grey with no undertones I’m trying to go for a “farmhouse look” with greys and bright white molding, but EVERY sample I’ve tried ends up with a blue, green or purple undertone in it. I’ve painted whole rooms, parts of walls, you name it but cannot find just a soft grey that looks right. I’ve spent so much money on the samples, I easily could’ve painted my house 2-3 times by now. Any ideas or help on a color would’ve greatly apppreciated.